specifyCoefficients defines the coefficients m, d, c, a, and f in the PDE model. specifyCoefficients(model,Name,Value) defines the specified coefficients in each Name to each associated Value, and includes them in model. You must specify all of these names: m, d, c, a, and f. This syntax applies coefficients to the entire geometry. Include geometry in model before using specifyCoefficients. specifyCoefficients(model,Name,Value,RegionType,RegionID) assigns coefficients for a specified geometry region. CA = specifyCoefficients(___) returns a handle to the coefficient assignment object in model. Specify the coefficients for Poisson's equation -∇⋅∇u=1. Therefore, the coefficients for Poisson's equation are m=0, d=0, c=1, a=0, f=1. Include these coefficients in a PDE model of the L-shaped membrane. Specify zero Dirichlet boundary conditions, mesh the model, and solve the PDE. 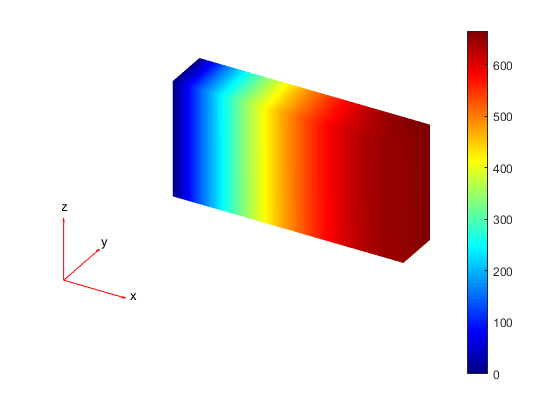 Specify coefficients for Poisson's equation in 3-D with a nonconstant source term, and obtain the coefficient object. The equation coefficients are m=0, d=0, c=1, a=0. For the nonconstant source term, take f=y2tanh(z)/1000. Set the coefficients in a 3-D rectangular block geometry. Set zero Dirichlet conditions on face 1, mesh the geometry, and solve the PDE. View the solution on the surface. Create a scalar PDE model with the L-shaped membrane as the geometry. Plot the geometry and subdomain labels. 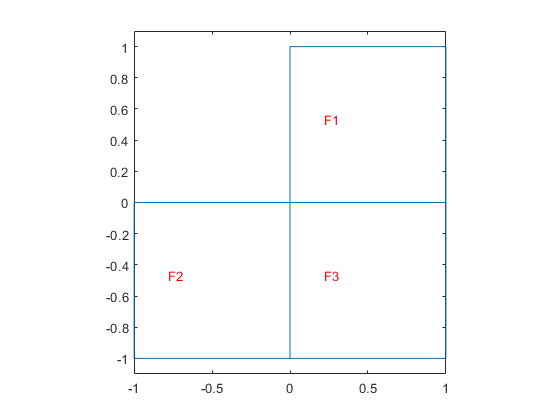 Set the c coefficient to 1 in all domains, but the f coefficient to 1 in subdomain 1, 5 in subdomain 2, and -8 in subdomain 3. Set all other coefficients to 0. 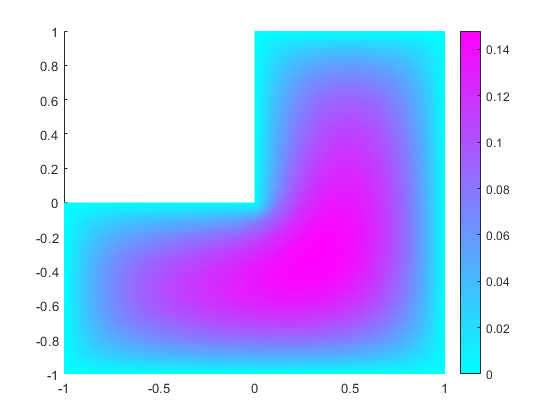 Set zero Dirichlet boundary conditions to all edges. 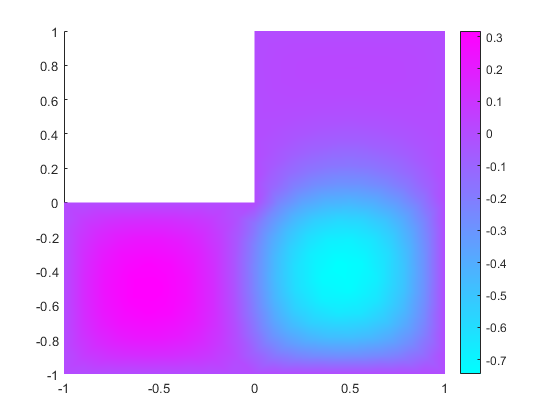 Create a mesh, solve the PDE, and plot the result. PDE model, specified as a PDEModel object. You must specify all of these names: m, d, c, a, and f.
Second-order time derivative coefficient, specified as a scalar, column vector, or function handle. For details on the sizes, and for details of the function handle form of the coefficient, see m, d, or a Coefficient for specifyCoefficients. Specify 0 if the term is not part of your problem. First-order time derivative coefficient, specified as a scalar, column vector, or function handle. For details on the sizes, and for details of the function handle form of the coefficient, see m, d, or a Coefficient for specifyCoefficients. If the m coefficient is nonzero, d must be 0 or a matrix, and not a function handle. See d Coefficient When m is Nonzero. Second-order space derivative coefficient, specified as a scalar, column vector, or function handle. For details on the sizes, and for details of the function handle form of the coefficient, see c Coefficient for specifyCoefficients. Solution multiplier coefficient, specified as a scalar, column vector, or function handle. For details on the sizes, and for details of the function handle form of the coefficient, see m, d, or a Coefficient for specifyCoefficients. Source coefficient, specified as a scalar, column vector, or function handle. For details on the sizes, and for details of the function handle form of the coefficient, see f Coefficient for specifyCoefficients. The d coefficient takes a special matrix form when m is nonzero. You must specify d as a matrix of a particular size, and not as a function handle. Call results = assembleFEMatrices(...) for the problem with your original coefficients and using d = 0. Use the default 'none' method for assembleFEMatrices. Take the d coefficient as a matrix of size results.M. Generally, d is either proportional to results.M, or is a linear combination of results.M and results.K. See Dynamics of Damped Cantilever Beam. For eigenvalue equations, the coefficients cannot depend on the solution u or its gradient.